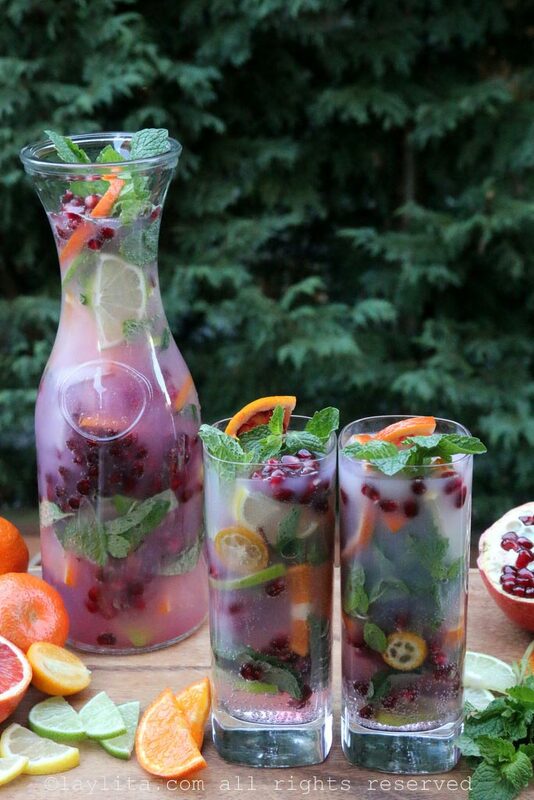 This colorful and refreshing citrus pomegranate mojito with arak was inspired by my trip to Israel. It’s no secret that I have an obsession with markets, and visiting local food markets is always #1 on my list when I travel to a new place. 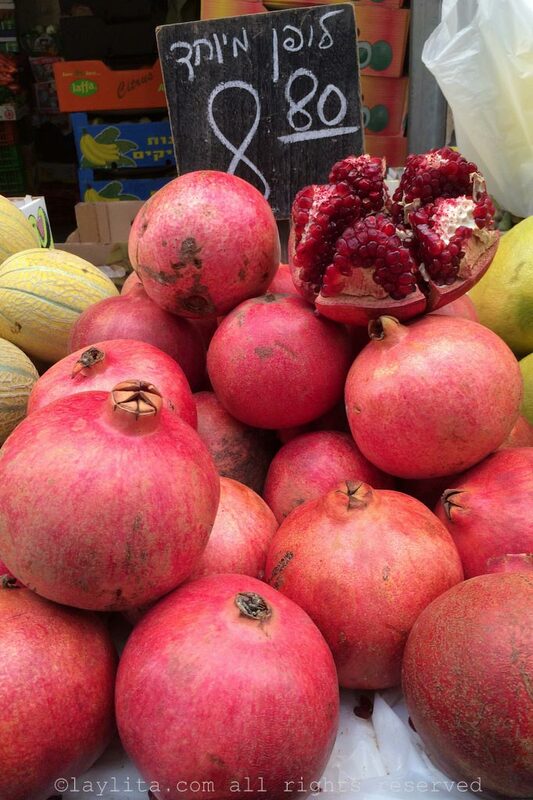 The markets in Israel were full of colorful and vibrant fruits. 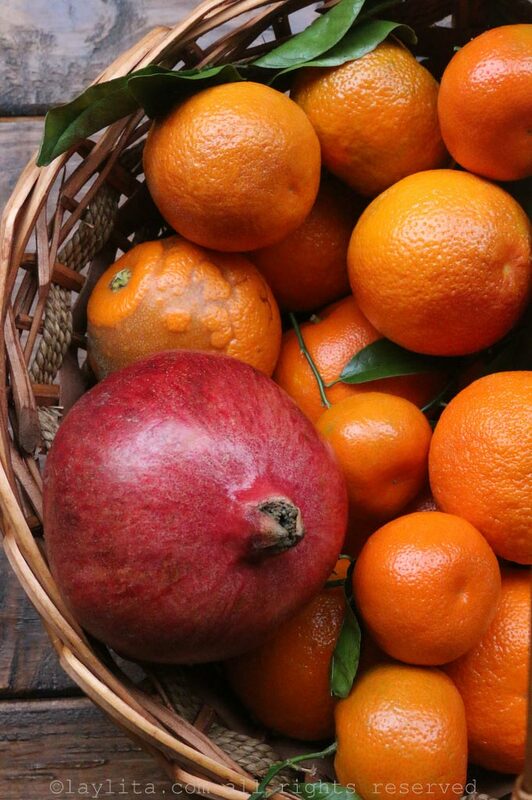 I particularly loved the selection of citrus and pomegranates. 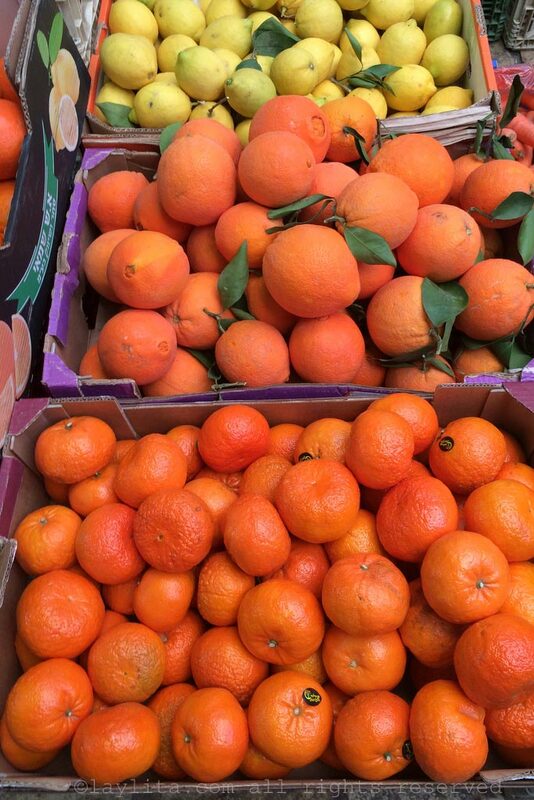 These fruits were not only everywhere at the markets, but also at breakfast meals, and at juice vendor stands from Jerusalem to Tel Aviv. 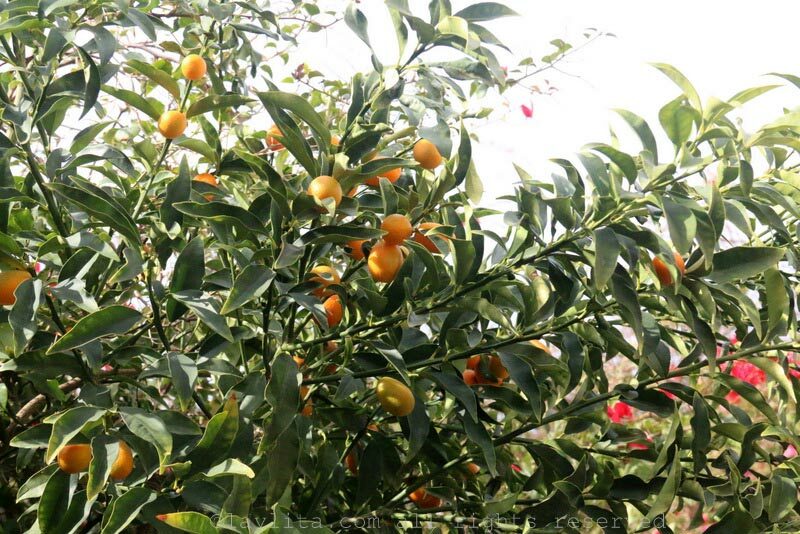 There were citrus (lemons, kumquats, and oranges) trees growing in many places, both in rural locations – all around our hotel Mizpe Hayamim in Rosh Pina to the patio of Magdalena restaurant in Migdal (Galilee) and even on balconies/small gardens in Tel Aviv. 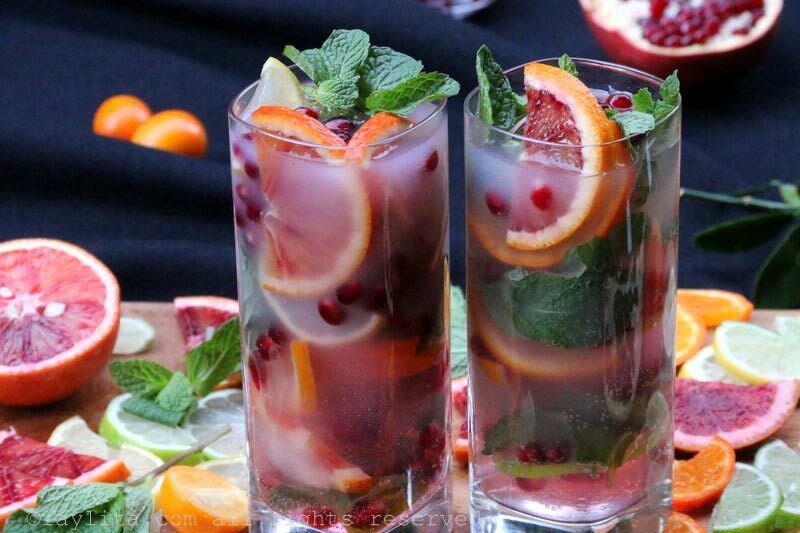 Colorful and refreshing citrus pomegranate mojito made with pomegranate juice, citrus fruit including blood oranges and mandarins, honey, mint, sparkling water, and arak (anise liquor). 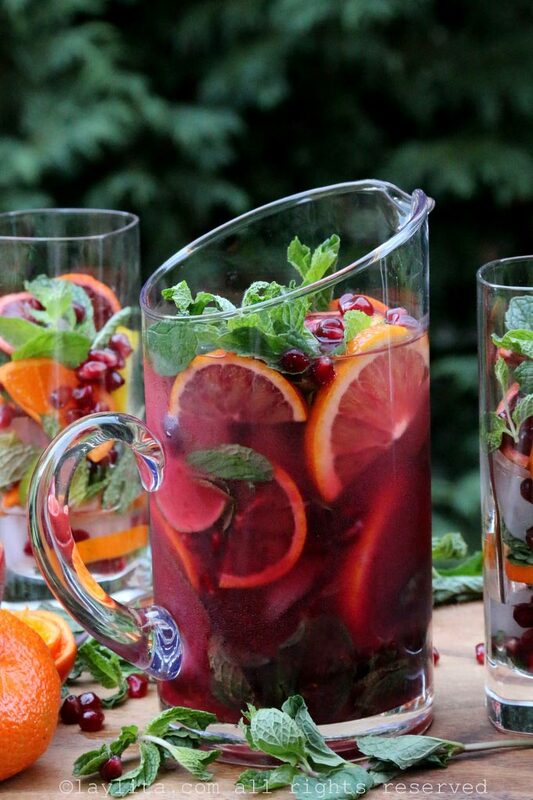 In a pitcher, muddle a couple handfuls of the mint leaves with the honey, don’t overly mash the leaves. The goal is to gently mix and release the minty oil and flavor. You can add the arak at this point, or add it later when serving each individual glass. Adding it later gives the flexibility of adjusting the amount of alcohol based on each individual’s preference. 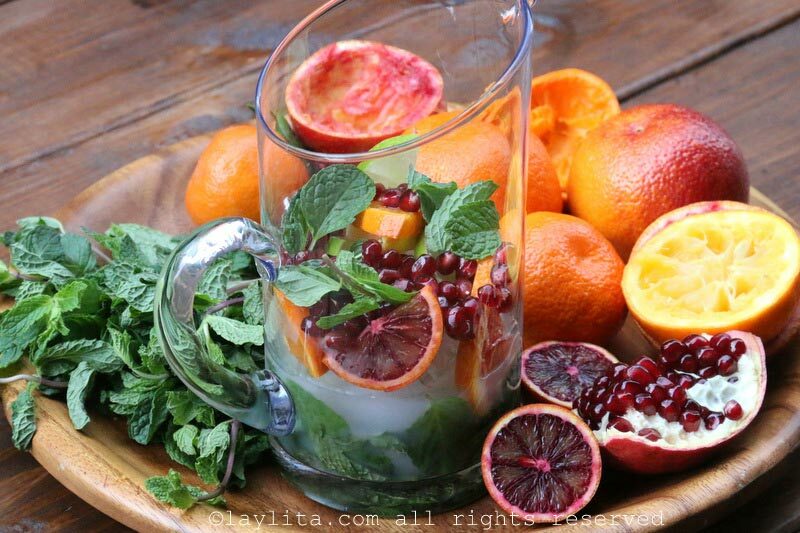 Add a handful of ice cubes and some of the citrus slices/pomegranate arils as well as additional mint leaves. 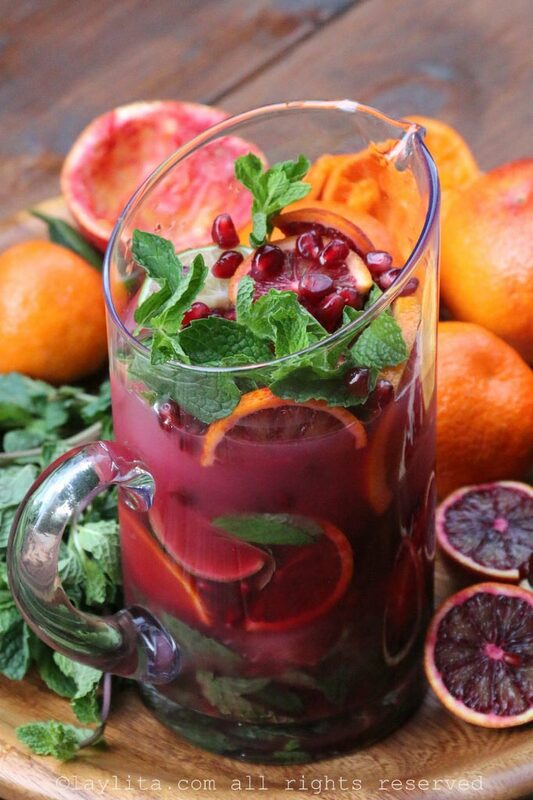 Add the pomegranate and citrus juice mix, stir well, and taste. Add additional honey if needed and top off with sparkling water. 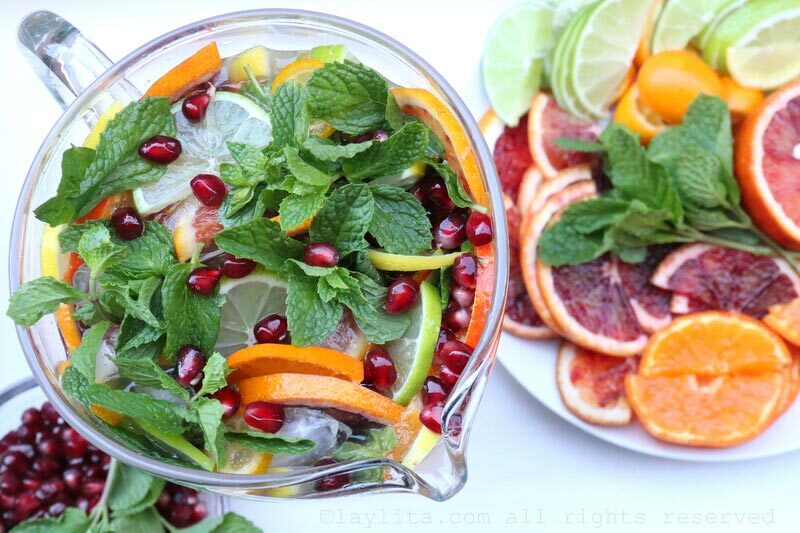 Finish by adding a few more citrus slices/arils/mint leaves. Add ice cubes and garnishes to each individual glass; pour the drink into each glass, add the liquor at this point if it wasn’t added before. 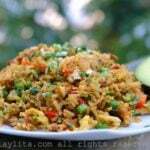 Stir gently and top off with additional sparkling water or club soda if needed. 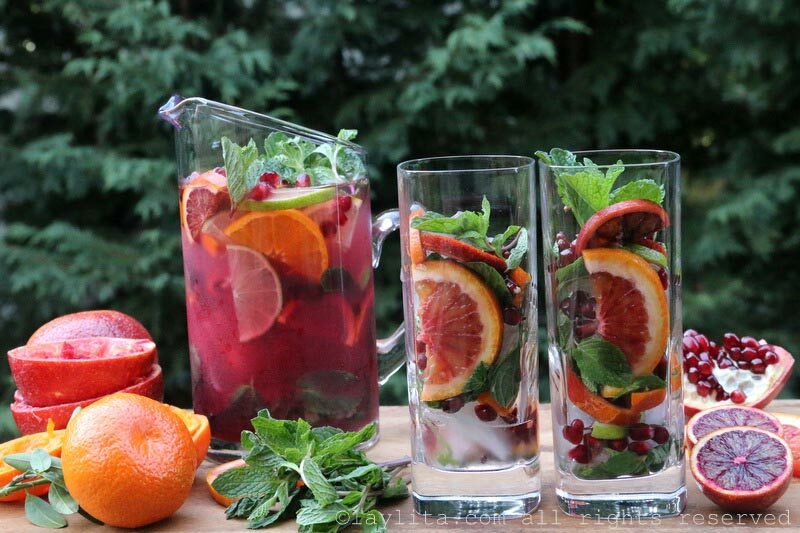 *Mocktail variation: To make this drink as a mocktail or non-alcoholic variation, leave out the arak or liquor. If you want to keep the anise flavor without the addition of alcohol, you can add an anise infused syrup to the drink. *1 cup measurement is equal to ~8 liquid ounces and ~236 ml. 1 liquid ounce is ~30ml. Many of the delicious meals on the Vibe Comida trip started with a shot (pure or diluted) of the local arak liquor. Arak, also called araq, is an anise based clear liquor that is popular in Israel, Lebanon, and other countries in the Middle East. 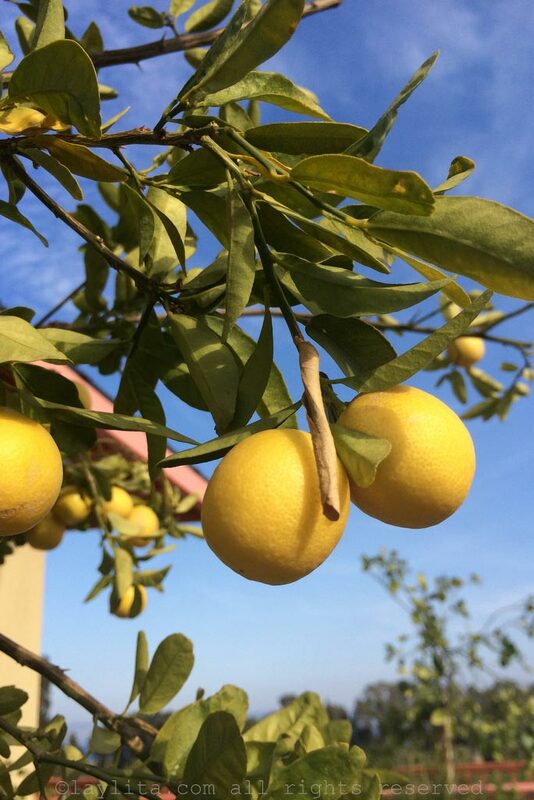 At first taste, its flavor is very similar to a French pastis or Greek ouzo, however one of the differences is that arak is made from grapes and is unsweetened, while pastis (and ouzo) is made with base alcohol and sugar. Similar to pastis, it does turn a milky white color when mixed with water. In some places we were served arak diluted with water and at many others it was served as a shot either before the meal and/or during the meal. I love making cocktails and find that starting a meal or party with good aperitif style cocktail is always a good choice. 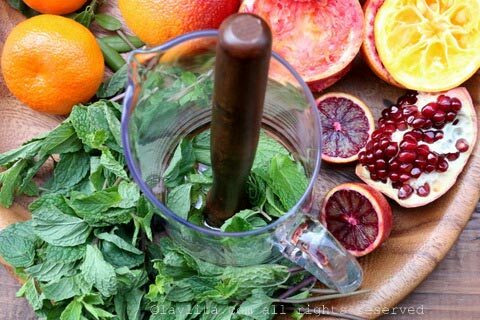 Making a mojito with pomegranate, citrus, and arak was really a no-brainer when you consider that these ingredients, plus the obligatory mint for the mojito are ingredients that are plentiful in Israel. I also used honey instead of sugar or simple syrup because I think that the honey flavor is a better match with the anise and citrus. 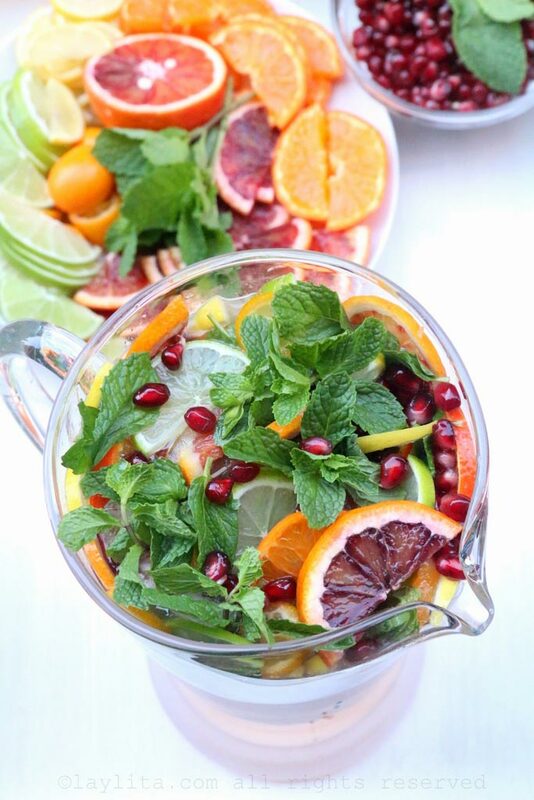 I used a mix of citrus fruits including blood oranges, mandarins or tangerines, kumquats, lemons and limes for this mojito recipe. 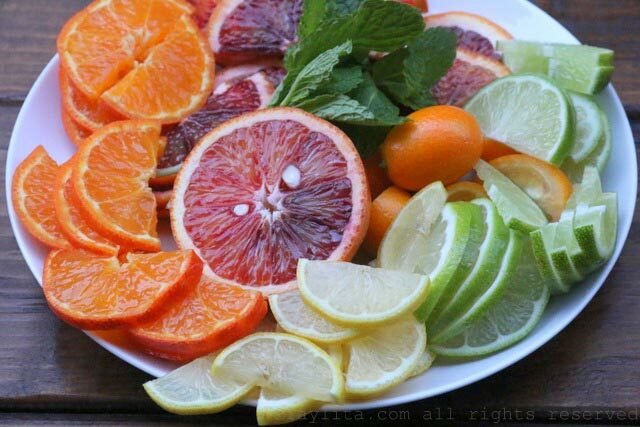 Feel free to adjust the fruits based on what you have available, I do recommend using at least two different types of fresh citrus. 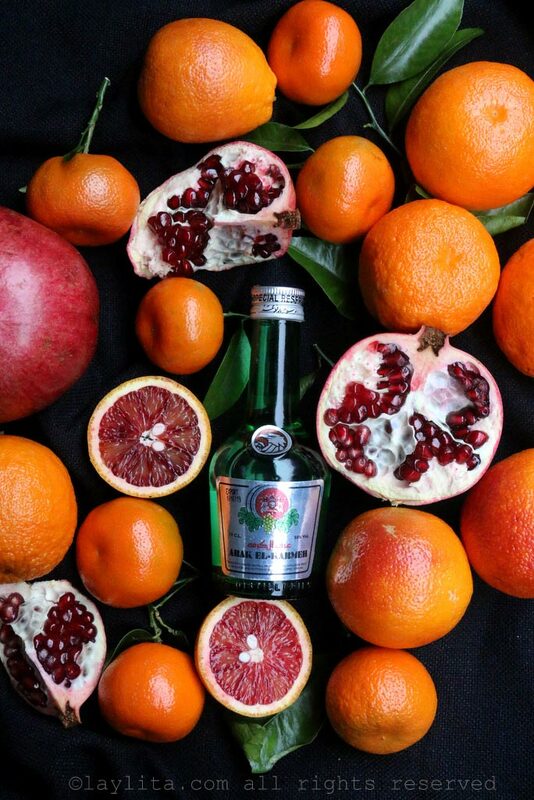 I used pomegranate arils to garnish the drink – given the seasonality of the fruit it might not always to be easy to find fresh ones. 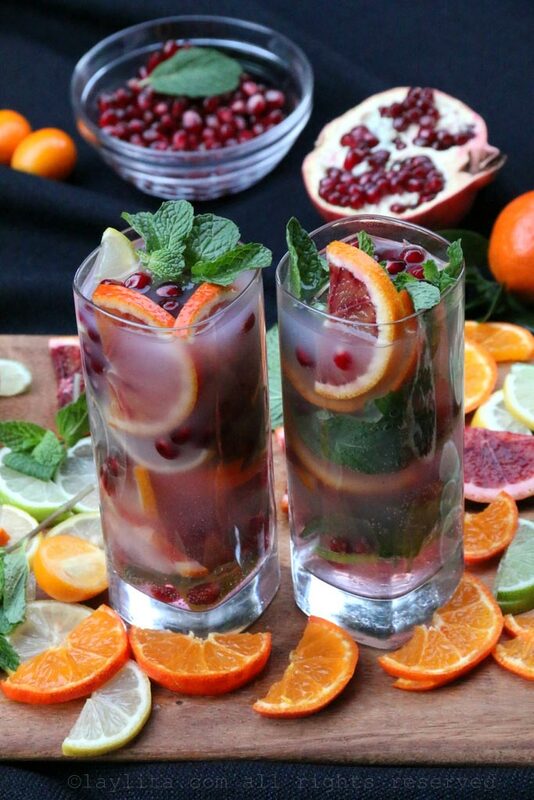 For the cocktail itself you can use a mix of pomegranate juice (available year round at most grocery stores and sparkling water or sparkling pomegranate juice (available at many grocery stores). I tried to find arak at my local liquor store and wasn’t able to find it, the closest I could find was the Turkish variation called raki. Raki, like arak, is made from grapes and unsweetened, so it’s probably the closest substitute I could easily find. Of course, you can also use ouzo or pastis to make this drink – you will hardly be able to tell the difference. I should also mention that anise flavored liquor isn’t everyone’s cup of tea, I know people that just don’t like the anise flavor. 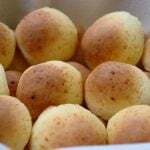 Personally, it was an acquired taste and it took me a few pastis drinks to get the taste for it, and now I really like. 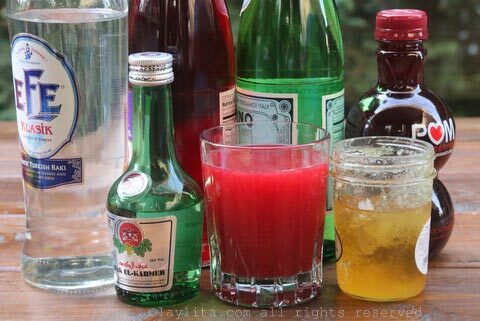 For this drink, especially if making it for a party or get together with friends, you can add the liquor at the end or to each individual glass – and for those that aren’t fans of the anise taste (give a sample before) you can use a different type of liquor. 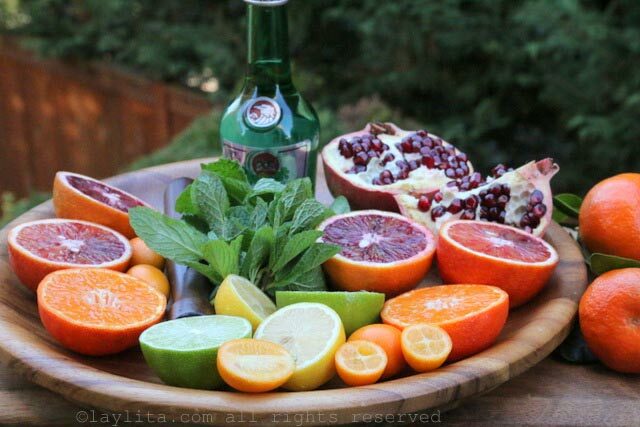 You will notice that when you add the arak or any anise liquor to the cocktail, it will change its color and give it a milky whitish hue. 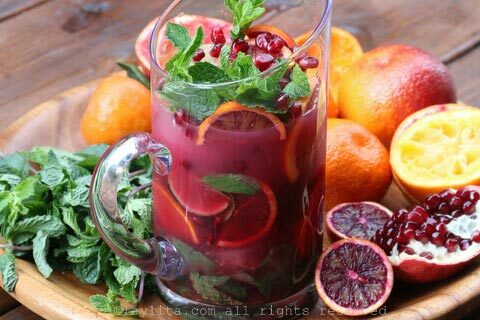 This drink can also easily be served as a non-alcoholic pomegranate citrus minty punch, simply leave out the arak or any alcohol. L’chaim! Cheers! Salud!